Earn 50% Commision as an Affiliate of FanVictor! That's right! Sign up as an affiliate with FanVictor and earn 50% commision on every purchase from your site! ClickBank is the exclusive retailer of Fan Victor, so in order to promote FanVictor.com you must become a registered ClickBank affiliate. To do this you will have to establish an account at clickbank.com. Once you are a registered ClickBank affiliate you will be able to send traffic through a special ClickBank generated affiliate link, and you will automatically be credited 50% commission for all sales that result from traffic you send through your special ClickBank affiliate link. Pick From One of Our Marketing Tools. We offer 3 types of campaigns for you to promote FanVictor. Simply copy and paste the code snippets from our marketing tools in to your existing website and begin earning money. 50% Commision on all sales! Sit Back & Get Paid! Once you get our ads on your site, your vistors will have access to our Fantasy sports plugin. With every purchase of FanVictor services from your site, you will receive 50% commision on each & every sale. Gauranteed! Billion's of dollars are spent on playing Fantasy Sports. Stake your claim & get in on the action! Affiliate marketing is considered to be one of the world’s fastest growing and best internet marketing techniques to earn money online. Combine that with one of the biggest & fastest growing industries - Fantasy Sports & start making money today! If you make enough money then you don’t have to worry about going to work at the same time every day or getting stuck in traffic. You can work in the comfort of your own home & choose your own hours! Marketing on the internet is cheap and you don’t have to worry about the production cost as the product is already developed by the seller. You don’t need a physical business location or hire employees either. Here are some marketing tools to help generate some revenue! Select from our collection of ad banners. Once you have registered with ClickBank you will now be able to utilize all our banner ads & start making money. Don't forget to add your affiliate url to our code snippets!!! Replace the XXXXX with your affiliate link. Select from our 2 email templates. 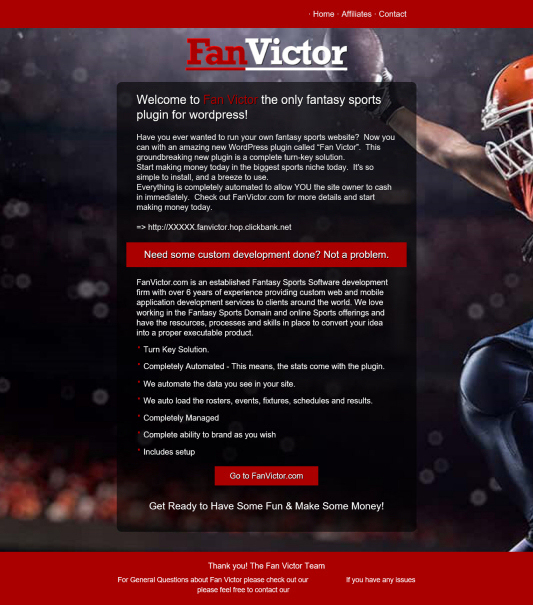 Create a Fantasy Sports site in minutes. Have you ever wanted to run your own fantasy sports website? Now you can with an amazing new WordPress plugin called “Fan Victor”. This groundbreaking new plugin is a complete turn-key solution. Start making money today in the biggest sports niche today. It's so simple to install, and a breeze to use. Everything is completely automated to allow YOU the site owner to cash in immediately. Check out FanVictor.com for more details and start making money today. I've been making money online, everyday now. And I've been keeping my highly profitable "secret" to make money online. But right now...I'm going to let you in on this "secret". For help setting up your custom email template please contact us today & we will have you set up for success in no time! Additional fees may apply. We offer our own promotion video. No problem. Our dedicated support team will help you get started. We can help you with any questions you may have. We also will help you embed our ads correctly to your site. We also can create custom email templates with graphics for more of a WOW factor in your marketing campaign. We want you to succed so we can suceed! Whatever your needs are we are here to help. So please feel free to contact us any time. Promoting FanVictor directly on your own website increases the value of your site and earns a commission based on each tracked sale. It's that simple. Affiliates are NOT permitted to run ads on Google Adwords, bid on "Fan Victor" based keywords, use the term "Fan Victor" in any pay per click ads, or create customer incentives for purchasing Fan Victor(through cash rebates or 3rd party bonus offers - NO BONUSING! Affiliates must also NEVER use any images that they do not own, and are forbidden from using any imagery that would imply any celebrity endorsement without written consent from both the celebrity AND FanVictor.com. Any affiliate caught breaking any of these terms will be banned immediately without hesitation.